New Arizona Wildcat makes choice with custom kicks. Today, several of the nation's top high school basketball recruits announced which colleges they will be attending next season. Traditionally, players announce the decision by putting on the hat that represents their choice. For Stanley Johnson, a five-star forward from Santa Ana, it was all about the shoes. 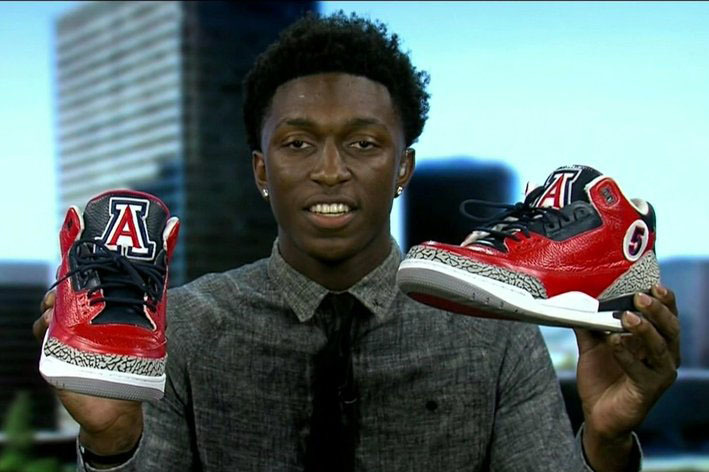 Johnson will attend the University of Arizona, revealing his choice with a custom pair of 'Wildcats' Air Jordan 3s. If you're not going to Oregon, you have to take matters into your own hands. Scouts widely consider Johnson a Top 10 2014 prospect. He also had offers from Florida, UConn, Kansas, Louisville, UCLA and Syracuse, among others.